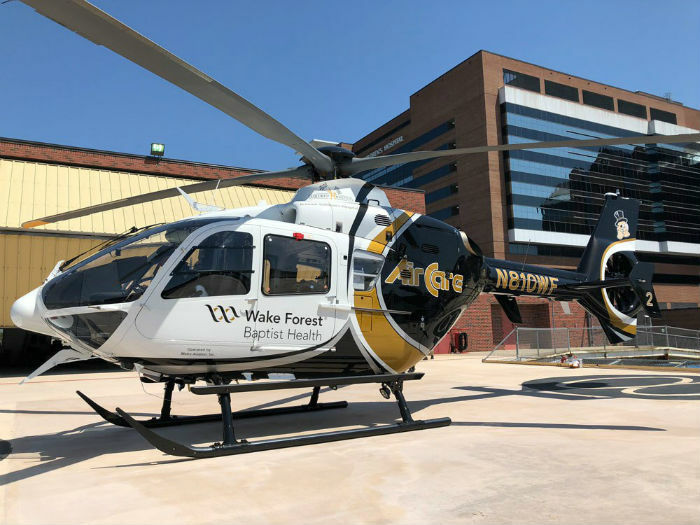 PAC International, a Metro Aviation company, recently delivered three refurbished Airbus EC135P2+ helicopters to Wake Forest Baptist Medical Center’s AirCare Program. Metro Aviation recently became the air operator for the 3-base program. The aircraft interior components were refurbished to include crew and medical attendant seats, all storage pouches, and complete reconditioning of the Metro EMS interior. The completion also included a new composite med floor with Ferno 28A-1 litter and Metro litter load ramp system, new interior and exterior paint, all new windows, Devore tail recognition lights, Metro exterior EMS lighting kits, Technisonic TDFM9100 FM communication system, Garmin GDL69 XM weather system and GTX330ES ADS-B certification, Honeywell MKXXI EGPWS, Outerlink’s IRIS flight tracking and data monitoring system and Aviation Specialties Unlimited supplemental NVIS lighting system. The aircraft are equipped with sophisticated life support and patient care equipment for the medical crew, which consists of a flight nurse and paramedic. PAC International has a worldwide reputation for providing a wide range of innovative, customer focused, and high-quality helicopter completion and customizing services on Bell, Airbus, Agusta, Sikorsky, and MD Helicopters. They have established a reputation for providing state-of-the-art services in helicopter painting, custom interior fabrication, and avionics installations, and have a long history of providing customized medical interiors to meet the mission specific profile of their customers.